The late Arthur Danto, noted art critic for The Nation, called Andy Warhol, “The nearest thing to a philosophical genius the history of art has produced.” Time will tell how Warhol and his images of Campbell’s Soup cans and Marilyn Monroes ultimately stack up against da Vinci and the Mona Lisa; but there’s no doubt Warhol and his fellow Pop artists influenced the post-World War II art world. Pop Culture: Selections from the Frederick R. Weisman Art Foundation explores the origins of the Pop art movement of the 1950s and 1960s, and its continuing influence on contemporary artists. The exhibition runs through April 23 at the Boca Raton Museum of Art and features 100 works by such Pop art grandees as Warhol, Roy Lichtenstein and Gilbert George. 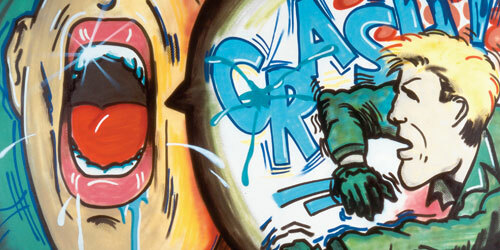 Pop art combines imagery from mass culture with fine art, often employing parody and satire. “This engaging exhibition beautifully demonstrates how artists both influence and are inspired by elements of popular culture,” says the museum’s director, Steven Maklansky.